THE STAGE IS SET. 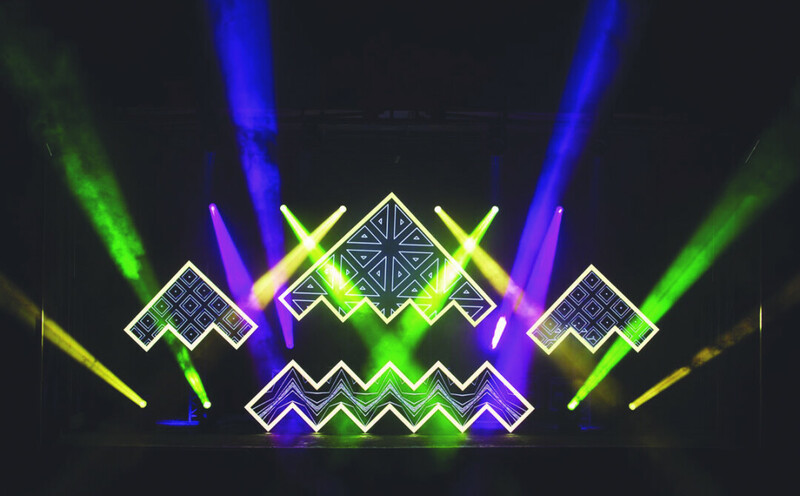 Antic Studios designed the main stage for this summer’s SubOctave Music & Camping Festival – an electronic music festival that takes place on a secluded ranch near the small town of Houston, Minn. – using programmable intelligent lights and projection mapping. When the sun came down over the festival grounds a few weekends ago, you may have noticed an interesting glow coming from the riverside. During the day, those large, white letters weren’t much other than an indicator you were at the right place, the Eaux Claires Music & Arts Festival. At nightfall, however, the sign lit up with colorful animations and dazzling 3D-mapped, projected visuals. The duo behind this spectacular light installation, along with an impressive catalog of other work, is Ryan Warffuel and Max Koehler of Antic Studios. A relatively new company, Antic initially specialized in projection mapping, but it quickly grew into something much more. Now, they’ve acquired some new gear: high-resolution LED panels and an array of intelligent lights. The studio even has high-end camera equipment to produce the rowdy and endlessly entertaining event recap videos you might see on their website. This brand of professionalism is something you might see in a production company that’s been in the field for years, but according to owner/creative lead Max Koehler, the company hasn’t been around for too long. He can pinpoint a date – Sept. 21, 2012 – as the birth of Antic Studios during a radical ’90s dance party at the House of Rock. Antic Studios has achieved some pretty amazing things in the few years its been around. After doing a short run of shows around the Midwest with Roster McCabe, they quickly found themselves doing visuals for the 515 Alive and Infrasound music festivals. They’ve even worked with EDM heavyweights like Baauer, RL Grime, Flux Pavillion, and Rusko. These aren’t your run-of-the-mill light installations either. These are real-deal, explosive, high quality projected visuals over 3D surfaces. You might think that with this surge of popularity and big names now attached to their résumés, Antic Studios might’ve swapped the Chippewa Valley for L.A. by now, but the pair discovered that working the Eaux Claires fest was one of their favorite things they’ve ever done. Antic Studios is certainly making waves and hoping to one day very soon bring its business to a national level. That might not be too difficult considering they recently have been in talks with some major artists and are getting ready to work the festival circuit with the 515 Alive Music Festival (for the third year in a row) as well as Summerset and Infrasound. Though they might go national pretty quickly, Koehler and Warffuel won’t forget their roots. “We see ourselves always being a part of the Eau Claire music scene, and definitely want to get more involved with all kinds of shows in the area, not just electronic music. We are excited to keep putting on shows in Eau Claire, and hope to help grow the music scene here. Once the Confluence Project is finished, we hope to start doing more frequent shows and potentially bring in bigger acts to the area.” Koehler said. To see Antic Studios’ roster of work and videos of its productions and events, check out www.anticstudios.com or hit up www.facebook.com/anticstudiosllc. If you’re looking to catch their work in action, snag some tickets to … well, pretty much any upcoming electronic-centered music fest in the region.